Purchase at least one (1) Nestlè Drumstick® in the following flavours: Vanilla, Chocolate or Caffè de Caramel. Take a photo/video showing creative uses of Nestlè Drumstick®. 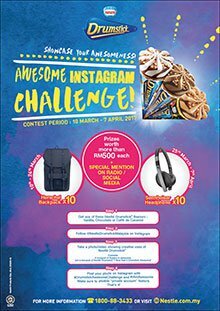 Post your photo on Instagram with #DrumstickAwesomeChallenge and #IAmAwesome. Make sure to disable "private account" feature. Visit Nestlé Drumstick Awesome INSTAGRAM Challenge Contest terms & conditions for more details.